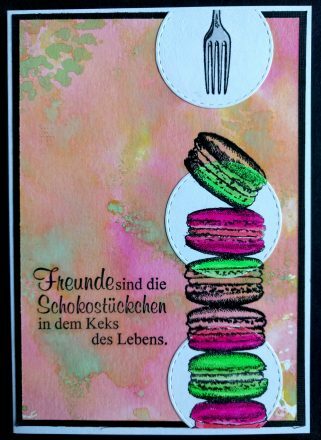 Jede Menge Farbe soll es diese Woche bei den Daring Cardmakers sein. Ich habe mein Motiv hemmungslos bei einer Freundin abgekupfert. Der Hintergrund ist mit der Gelliplate gemacht, in ein paar Bereiche habe ich mit weißer Acrylfarbe die Farben etwas gedämpft. 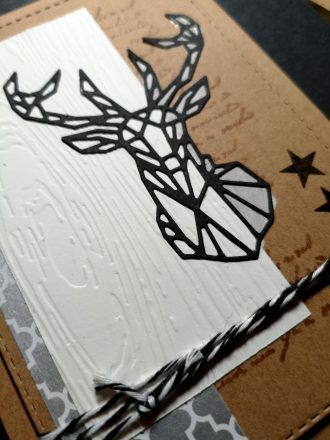 The Daring Cardmakers want to see loads of colours this week. I have shamelessly stolen my idea from a friend. 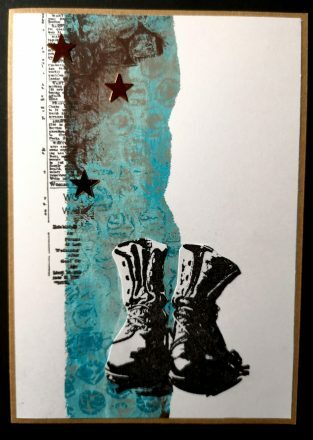 The background was created using my gelliplate. I toned down some parts with white acrylic paint. Welcome to 2019! I know it’s been quiet here this past month but now I want to make a fresh start, beginning with my card for the Daring Cardmakers january elemental inspiration challenge. The Daring Cardmakers have provided a first Christmassy inspirational picture. 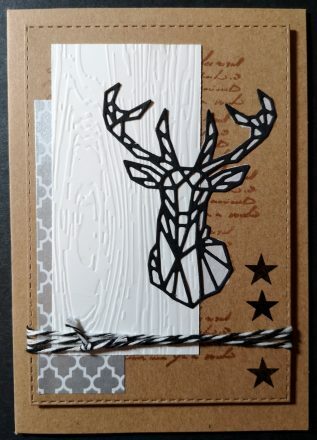 I went for colours, twine, wood and a deer. …das brauche ich unbedingt. 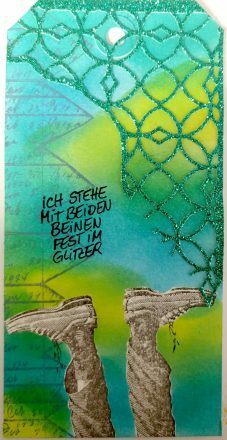 Mein Thema für die Daring Cardmakers ist Glitzer. 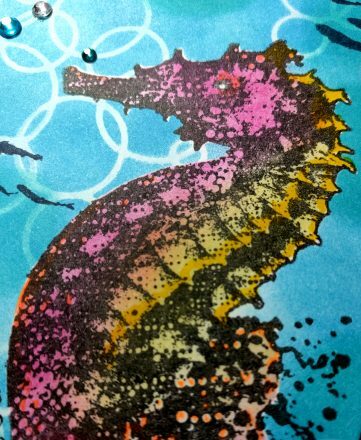 This week’s theme at the Daring Cardmakers’ is: glitter. Add some sparkle! 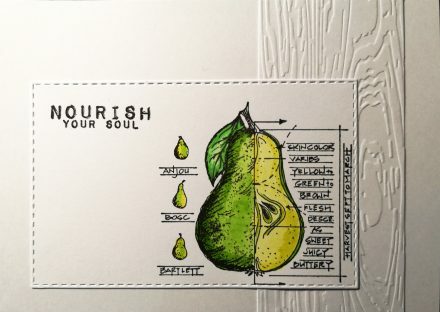 The Daring Cardmakers are celebrating apple day: all kinds of tree-grown fruit are most welcome this week. I tried to go for something very, very clean & simple. 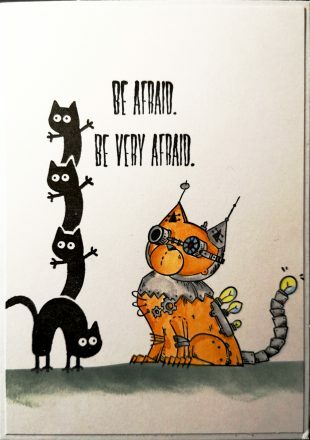 This week it’s all about our furry friends at the Daring Cardmakers’: pets. Decide for yourselves who is scaring who (more) on my card. Nach einer kleinen Erholungspause geht es schon ein bisschen herbstlich weiter. Dawn hat tolle Fotos für die Oktober-Inspiration zusammengestellt und insbesondere die Farben fand ich einfach unwiderstehlich. 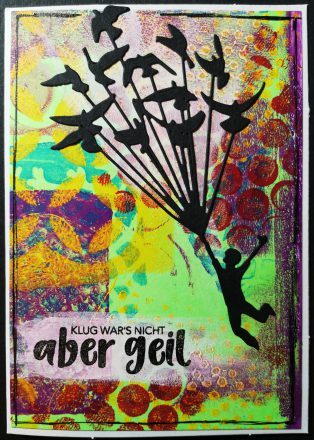 Die Kreise habe ich aus dem Ergebnis der letzten Gelliprint-Exzesse ausgestanzt. After a bit of a recreational break I’m continuing here with some autumnal colours. Dawn has chosen some great pics for the Daring Cardmakers elemental inspiration and I just couldn’t resist those beautiful, beautiful colours. 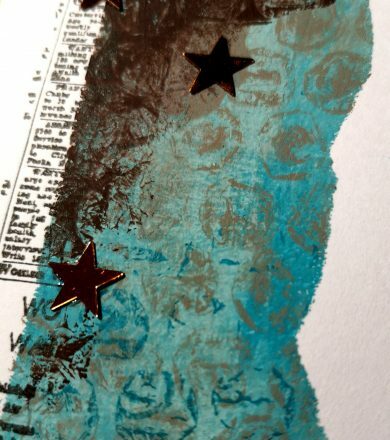 The circles were punched out from some results of my last gelli-printing-sprees. 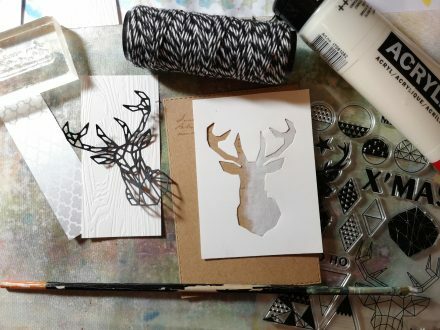 The summer hols are coming to an end and the Daring Cardmakers are going “back to school”. (My card is for the kids from the back of the classroom. 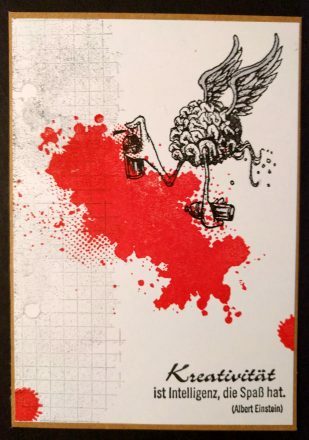 Text translates “creativity is intelligence having fun”. 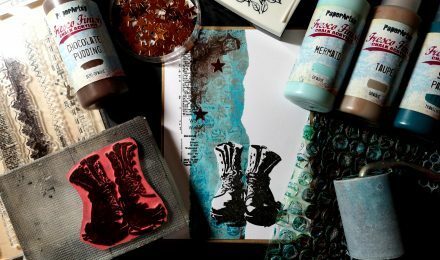 …soll diese Woche die Inspiration bei den Daring Cardmakers. Essen als Motiv oder verwendete Küchenutensilien – was immer euch zu dem Thema in den Sinn kommt. 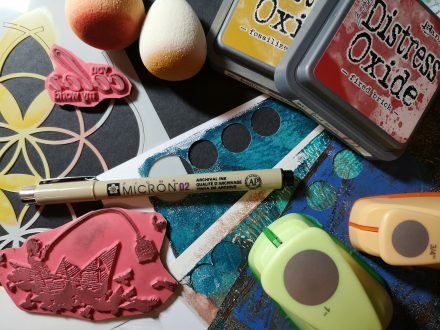 This week’s theme at the Daring Cardmakers’ is “what’s cooking?” – make a food-themed card or use some kitchen utensils – whatever comes to mind. Text translates: Friends are the chocolate chips in the cookie of life. Diese Woche geht es bei den Daring Cardmakers maritim zu. Und ich wollte endlich was mit dem tollen Seepferdchen von Visible Image machen. 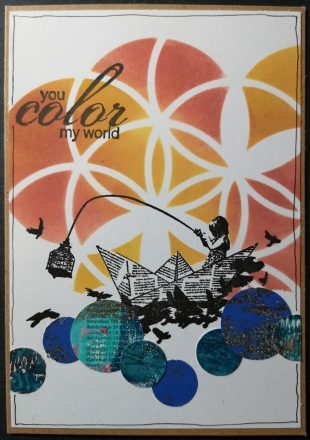 We’re “going nautical” at the Daring Cardmakers’ this week. 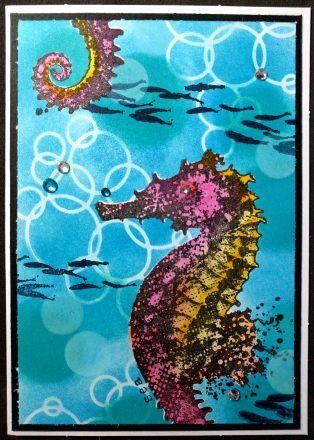 A good chance to finally try out the beautiful seahorse stamp by Visible Image.